It’s quite easy to spot rusty garage door panels or a broken spring. However, sometimes the door can behave oddly for days or months without a single clue on what is actually wrong with it. Don’t leave things to chance. Understanding what each erratic behavior means can help you deal with the problem. Is your garage door squeaking during its opening and closing? This is most likely the result of friction related issues. Lubricating the torsion spring, metal rollers and the screw or chain drive of the opener (if it has one), should help solve the problem. If the issue persists, you should check and lubricate the hinges as well. If they have oval rather than round cylinders, they are worn and should be replaced. Ideally, the new hinges will be made from heavy-duty galvanized steel. These can be among the worst noises a garage door can produce. They are usually the result of frayed lift cables. A simple check will confirm the problem. The solution involves replacing the cables as soon as possible. If one of them snaps, the door may get off track or collapse. Less often, the sounds are caused by obstruction or misalignment of the tracks. These problems are also quite quick to discover. Obstructions should be removed quickly, to allow the rollers to move smoothly again. Adjusting the two sections of the track and tightening the bolts of the brackets will keep these components properly aligned. These are probably the least scary noises your door could make, but they can be more than frustrating. They are produced by worn metal rollers. The only solution to the problem is to replace the worn parts. You can choose from rollers with metal and nylon wheels, as each offer different benefits. The former tend to be more durable while the latter are quieter and don’t need lubrication. Remember, the actual task of roller replacement requires professional training, so be sure to leave things up to our technicians. You might be surprised to learn that signal interference is the least likely cause to this problem. This is because modern openers come with a technology which uses two or three frequencies for signal transmittance and reception. This practically eliminates the risk of interference with other devices like baby monitors and appliances like microwave ovens. This kind of issue can occur in very rare cases when there is an airfield and/or a military base close to the house. An automatic garage door will usually open by itself when there is a short in the remote control's wiring or a malfunction with the circuit board. When you leave for work in the morning, for instance, and push the button to close the door, it will go down. However, the remote will keep sending a signal to the receiver as you drive away from the house and the opener will open the door up. Either that or the circuit board will keep "receiving" the order. That is why you may find the door open when you come back home. The solution involves replacing the remote or the circuit board with a new one. 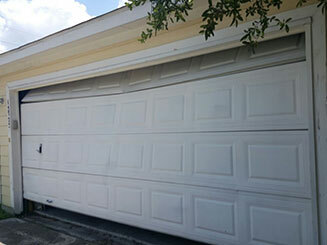 Let our team at Garage Door Repair Trumbull fix this or any other opener related problems for you quickly and safely.